Dearest Blog: This weekend, my local cinema happened to get all four new wide-releases, so I had the unusual luxury of choosing among all of them. The presence of Sebastian Stan made Ricki & the Flash my must-see, and the schedule dictated Fantastic Four wrap up the double-bill. Spoiler level here will be mild, limited to trailer reveals. Following a couple weekends that gave me a couple of my favorite guys (Jake Gyllenhaal and Jeremy Renner) in a couple of pretty great movies (Southpaw and Mission: Impossible - Rogue Nation), I suppose I was due for a letdown. Boy did I get it. First on Saturday's agenda: Ricki & the Flash. Having long ago left her family to follow dreams of rock stardom, a middle-aged woman returns home to comfort her newly-dumped daughter. In the interest of full and fair disclosure, I'll admit I hate movies like Ricki & the Flash, and, were it not for Sebastian Stan's presence, I wouldn't have seen it for a million dollars. That being said, if it were a good movie, it would have won me over, and I'm sure my tone is already telling you, dear reader(s), it did not. Ricki & the Flash is cliched and predictable. The characters are paper thin, not one has any depth or ever, once, does a single thing that isn't exactly what you'd have expected him/her to do. There are a few genuinely funny moments, but the "humor' is mostly awkward and occasionally vaguely racist in a way that's meant to flesh out a character but instead just left me mildly uncomfortable. Even the mostly-decent classic rock soundtrack is handicapped by ho-hum performances. Not being a "musical," per se, where the plot is actually advanced by the songs, the movie would have been better served by brief clips of the band onstage, rather than the excruciating full numbers to which we're repeatedly subjected. Meryl Streep is a goddess, and if there's a movie fan out there who'll dispute that, well, it's not this one. She manages to bring *something* to Ricki, a character that's otherwise blandly unlikeable and uninteresting. She's especially effective portraying the depressing physical realities of middle age on a person who's mentally only ever going to be a teenager. Once again, someone has grossly overestimated Streep's appeal as a singer, but her fantastic screen presence makes that easy enough to forgive. It's hard to watch Streep's real-life daughter Mamie Gummer wallow through the movie, and I couldn't honestly say whether the blame falls on actress or character, since Gummer is pretty hard to watch in everything. The good news is the rest of the supporting cast is terrific, if underused. As Ricki's long-suffering guitarist and beau, Rick Springfield does well in the movie's most thankless role, though he strangely looks ready to burst into tears the entire time. Sebastian Stan is great in his two minutes of screen time, for the first time in his entire career, playing the NON-problematic son of a messed up family. Go Sebastian! Finally, Audra McDonald is as glorious as always as the woman who stepped in to clean up the mess Ricki left behind when she set off to become a rock star. It has to be one of cinema's worst crimes against humanity to have McDonald, one of the world's greatest singers, appear in a movie about a singer, yet not sing a note. Even Stan and Gummer get to sing a few lines, for Pete's sake!! Ricki & the Flash runs 101 minutes and is rated PG13 for "thematic material, brief drug content, sexuality, and language." 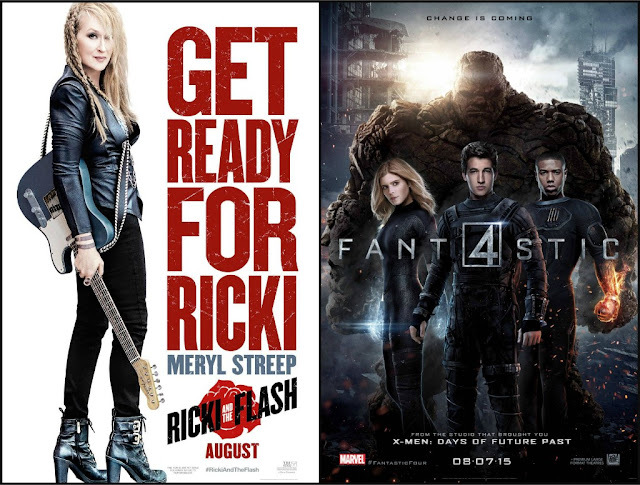 A shameful waste of a solid cast, of a possible nine Weasleys, Ricki & the Flash gets four. Next on the docket, the most recent screen rendering of Fantastic 4. In an experiment gone wrong, four young college students find themselves physically altered and must use their new powers to save the planet. Sound familiar? I know, right?? If there's one thing I hope Hollywood has learned from Fantastic 4's dismal reception, it's that we, genre and general fans alike, are tired of origins stories. Everyone knows why Bruce Wayne and Peter Parker are so sad on Fathers' Day, JUST MOVE ON. While that's far from the only reason people aren't flocking to see this humdrum version of some fairly humdrum heroes, it's got to be one of them. Dear reader(s), you may count me among those who didn't mind 2005's Fantastic 4, nor its 2007 sequel. They aren't special movies, but they're fun enough. The problem with the latest F4 is that it's no fun at all. It would be misleading to call the movie a slow starter, because that would imply that, at some point, it picks up. It is, in fact, a slow starter, a slow middler, and a slow finisher. The only way to mark the passage of time at all is to note the differences in Miles Teller's acne spots. The movie is dark, not so much in tone as in appearance, and at times it's difficult to tell what's going on at all. Jamie Bell, a fine actor (for my money, the best of the principal cast) is completely wasted, and, of those who get decent screentime, only Michael B. Jordan manages to be even half-watchable. Teller and Kate Mara are phoning it in, clearly as bored with the proceedings as the few of us who have bothered seeing the movie this weekend. The CGI ranges from just okay to laughably bad, inexcusable for a would-be summer blockbuster. It's not hard to see why Hollywood left this one in the landfill of August releases. Fantastic 4 clocks in at 100 minutes and is rated PG13 for "sci-fi action violence, and language." Trust me when I tell you, "fantastic" is not the "F" word you'll be saying if you waste your hard-earned dollars on this. Of a possible nine Weasleys, Fantastic 4 gets three. 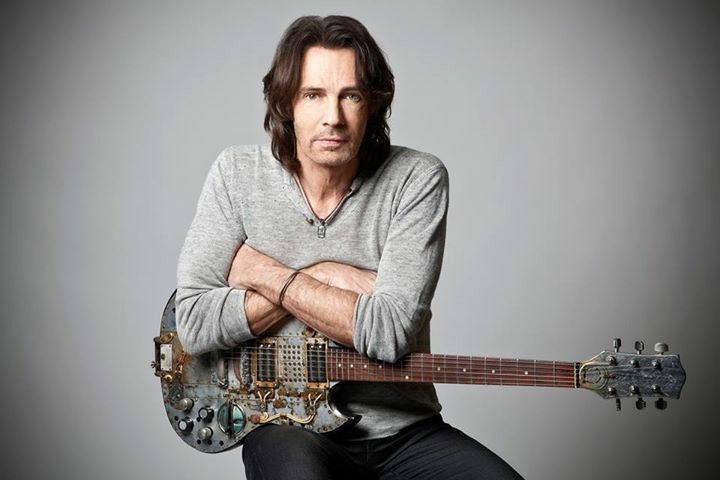 Rick Springfield: Four decades of being hot enough to make mediocre movies worth the price of admission!